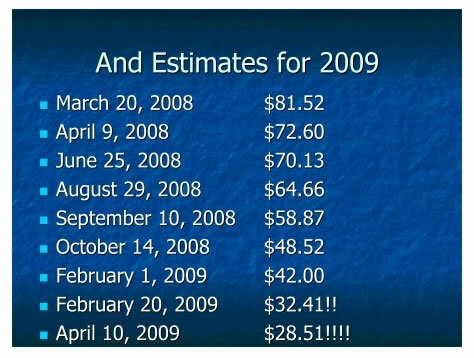 The analysis of April 26th concluded that the Dow is targeting a high of 8,750 by mid May 2009 which was expected to be followed by a significant correction of 14% towards a Dow target of 7,500. The Dow hit the target on 2nd of June which was confirmed in the quick update at the time, and therefore expectations were for the significant correction to materialise. Quick Technical Analysis - The Dow spent early June distributing along 8,800, which gave plenty of time to put on short positions with tight stops. The key chart trigger was the lower high at 8,600 which targeted a break of 8,200. The pattern size is 400 points which projects to 7,800 before the next expected bounce. The overall pattern size is about 650 which projects to 8,200 minus 650 = 7,550, which is pretty close to the original projection of April 26th for the target for the Correction AFTER the peak around 8,750. The chart is also showing an head and shoulders price pattern witch the same measuring move. Stocks Stealth Bull Market End Probability - The probability of an end to this fledgling bull market remains very low at less than 20%, as the Dow has so far done nothing to suggest otherwise with the trend to date inline with expectations for that of a significant summer correction. The quality of the stocks bull market for the balance of the year will become clearer as the current correction unravels towards 7,500, which will enable me to generate an in depth analysis for the next 3 months or so, however existing analysis is for a 50% rally which targets Dow 9,705. Conclusion - The Dow is still projecting towards a target of around 7,500 as indicated in the chart above, which I am sure will be taken by the perma-bears as proof that the whole move from March was just a bear market rally, JUST AT THE POINT WHERE I EXPECT THE STOCKS STEALTH BULL MARKET TO RESUME!. The in depth update to the stealth stocks bull market will follow towards the end of this month, to ensure you receive this in your email box subscribe to my always free newsletter. Make a note of these graphs as by year end everything will have been revised higher and previous corporate earnings projections conveniently forgotten, off course by that time the market will have already moved. Remember you are trading the price and NOT the earnings forecasts which are a red herring! Trading Signals - Whilst my analysis usually tends carry clear conclusions, however I have refrained from sharing my actual trading signals to date for a number of reasons which I have touched on in past articles. Good news, I will be sharing my actual precise position trading signals for free at WalayatStreet.com i.e. buy / sell triggers, stops, and stop and reverse (SAR) points for the Dow Jones Stock Index which I have been trading for the past 23 years. WalayatStreet.com has been under development since March 2009 and will go live this month, in the meantime WalayatStreet.com continues to point to my extensive articles archive. 6. Stealth Stocks Bull Market, Sell in May and Go Away? - 26th April 2009 - Tradable significant correction to follow from a peak around 8,750, downtrend towards Dow 7,500 over the summer.